Ms Cajiga was selected as one of the official artists for the 1992 Olympics and the 1996 Centennial Olympics in Atlanta, Georgia. 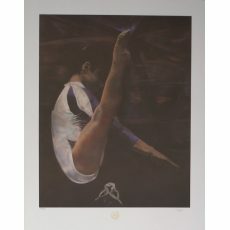 She created Gymnast and Peace Through The Olympics. Patricia is a renowned Figurative artist in Mexico and studied under the influence of Diego Rivera. Her work is displayed at the Galleria de Arte Misrachi-Genovaz in Mexico and has exhibited her artwork throughout Mexico and Colorado. Cajiga was born in Mexico City. She graduated from Universidad Ibepoamericana Mexico with a master in Philosophy and continued her education at Foundation De Recherches et d’Editions Neo Helleniques receiving a Ph. D in Philosophy. She also holds a Masters in French from Lausaune Switzerland – Mexico. Along with her other degrees, Cajiga received tutelage from Master Jose Bardasano, Spanish Painting School, and Masters Nishizawa and Arevela, National School of Arts – Mexico. She currently practices with Master Feher. Cajiga exhibits: 1977 Nuevo Mundo University in Mexico and Ramos de la Paz Gallery; Jockey Club Gallery in 1978; 1980 and 1981 Banca Baupacifico Cultural Foundation, Mexico; an individual display at Fonagora Fonapas (Government) Gallery in 1982; 1983 Domecq Cultural Foundation and Ibereo Latin American Bienar of Self Portrait; Modern Art Museum of Aspen, Colorado in 1986; also in 1986 National Institute of fine Arts (Government), Mexico and Diego Rivera 2d Bienal; 1987 El Reloj Gallery (Government), Mexico and an individual showing at Gallery Feralide in Aspen, Colorado.